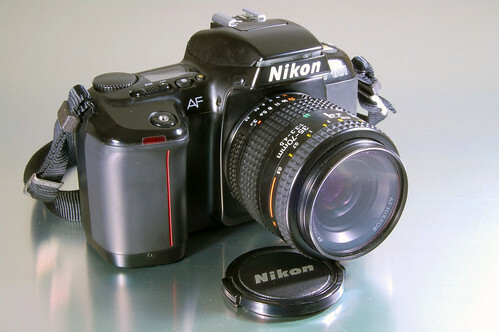 The F-601 is a autofocus 35mm film SLR, announced in the fall of 1990 by Nikon. It is also known as the N6006 in the US. 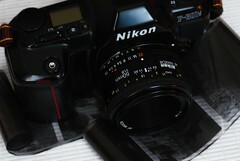 It accepts Nikon F mount lenses. 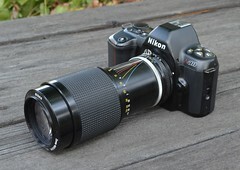 It uses a electromagnetically controlled focal plane shutter with speeds from 30s to 1/2000 with a battery powered B mode. Flash sync is at a maximum of 1/125 a sec. The self-timer is electronic and can be set in 1 sec increments from 2 to 30 sec. A two shot mode is also possible with a 10 second delay for the first shot and 5 sec for the second. It features three metering systems; matrix metering, center-weighted, and spot. Program modes include P, PM, S, A and M modes. The meter has a range of 0 to 19 EV at (ASA 100, f/1.4), settable to film speeds from 25 to 5000 ISO for DX encoded film but can also be manually set from 6 to 6400 ISO. 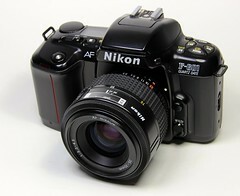 The camera contains a built-in TTL flash with a GN of 13 and can be used in auto and fill-flash modes. 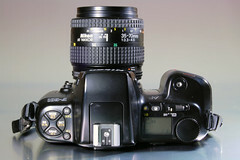 The flash head can be released by pressing the release buttons on both sides of the prism housing. The film transport is motorized. It supports automatic first frame film loading, and can be advanced in S (Single), CH (Continuous High, 2fps) or CL (Continuous Low, 1.2fps) modes. It uses a single 6v CRP2 battery. Date back versions also use a CR2025 battery. A variation was released as the F-601M or N6000 in the US. 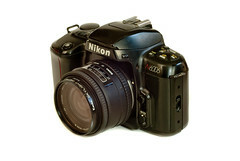 This model is a simplified version which removes autofocus as well as the built-in TTL flash. This page was last edited on 19 October 2018, at 01:34.